The world today can be so chaotic, sometimes you need to step away from it all and find something simple and calming. Then again, things that seem plain on the surface will sometimes reveal ever darker and more impenetrable mysteries over time. If you’re intrigued, you need the soothing, hypnotic patterns of a wenge dining table from Mac&Wood. Also known as African rosewood, the visually striking wenge wood is versatile enough to adapt to any vision. It creates the perfect contrast to soft hues and a light interior design scheme. It blends effortlessly into an elegant, luxurious interior. It fits neatly into a clean, modernist space. And if you have shaped your home towards a more traditional theme, a wenge dining table from Mac&Wood will meet every expectation and more. It is a well-defined, tasteful structure that is ideal for just about any aesthetic. With its tight grain and mesmerising patterns, the natural beauty of this dark, mysterious wood is further enhanced by the contemporary designs, craftsmanship and dedication to quality that we offer here at Mac&Wood. The durability of this material means that this sublime statement piece will last a lifetime. Its toughness is undeniable, and a Mac&Wood wenge dining table can endure extreme wear and regular strains that happen every day in a busy house. We work tirelessly to make sure that the final product is a precise incarnation of your vision, the exact table that you want. To do this, we always invite you to join in the design phase, redefining the meaning of bespoke – this isn’t just a table for a house, this is your wenge dining table made for your home and lifestyle. 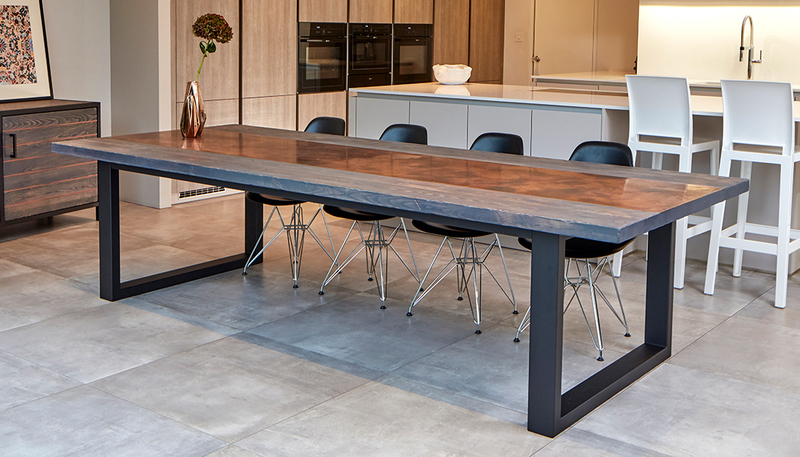 As we pour our creative passion into the making of every wenge dining table, we can guarantee that it will become a proud feature of your home, a piece that exudes the sense of calm and stillness that is essential for bringing people together.